A Parramatta Eels junior, Inu made his first grade debut in the 2007 NRL season against the Canberra Raiders. After just one first grade match he was named to play for New Zealand in the ANZAC Day Test against Australia at Suncorp Stadium inBrisbane. The Kangaroos ran out easy 30-6 winners over the Kiwis. After the test, Inu was dropped back to Premier League but returned to first grade through a series of injuries to regular players. Inu took on the kicking duties as Parramatta's primary kicker and full-back, Luke Burt, was injured mid-season. In Round 25 Inu scored three tries and kicked seven goals in Parramatta's 46-point win over Brisbane. In 2007, along with Hayne, Inu was the Eels top try-scorer. After a 2-4 start to the 2009 season, the Eels decided to re-tool their line-up, dropping Inu to the New South Wales Cup, withTaulima Tautai replacing him for the Round 7 match against the Brisbane Broncos. However, Inu returned to first grade from Round 10 onwards and was a large part of the Eels run to the 2009 NRL Grand Final where they were beaten 23-16 by theMelbourne Storm (the Storm would eventually be stripped of both their 2007 and 2009 premierships due to salary cap breaches, with no NRL premier recorded for either season). 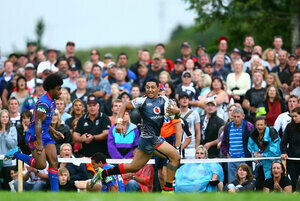 In May 2010, Inu signed a 3 year deal with the New Zealand Warriors from the 2011 NRL season. He was dropped mid season but made his way back into the team through injury and was an integral part of the Warriors run into the Grand Final in 2011. Inu's up-and-down tenure at the Warriors was curtailed in May 2012 with his release and immediate signing with the Canterbury-Bankstown Bulldogs. Inu was released by the Warriors in May 2012 so he could immediately join the Des Hasler coached Bulldogs. He signed with the Bulldogs until the end of the 2015 season. Again he would help his new club make it to the Grand Final of 2012 and yet again his team would lose.